CORVALLIS, Ore. – The experimental extreme draining of a reservoir in Oregon to aid downstream migration of juvenile chinook salmon is showing benefits but also a mix of unintended consequences, including changing the aquatic food web and releasing potential predators downstream. The impact is on the entire river system is uncertain, the researchers say, but the effects for juvenile salmon are twofold. 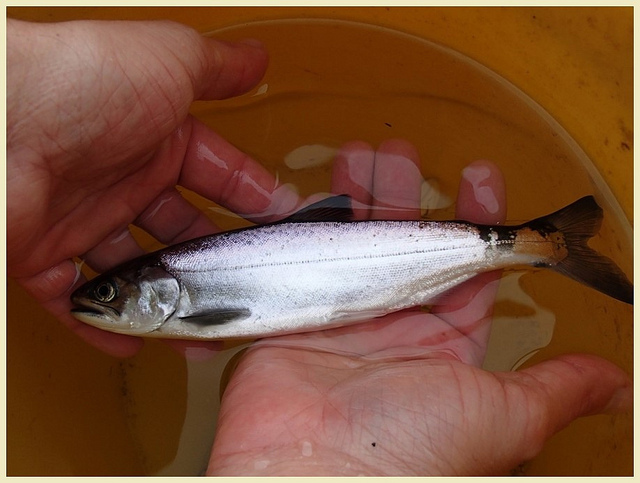 First, it helps their migration downstream; and second, it may reduce predation on the next class of incoming juvenile salmon the following summer. For the past several years, engineers have lowered Fall Creek Reservoir in the Willamette River basin to its original riverbed during the fall to help juvenile spring chinook salmon out of the reservoir for their downstream migration. A team of researchers from Oregon State University and the U.S. Forest Service Pacific Northwest Research Station then looked at the remaining fish, vegetation, invertebrate populations, nutrients and oxygen levels to see the effects of the one-week draining period. What they found surprised them. Native rainbow trout and invasive largemouth bass that remained in the reservoir after draining had switched their diets from fish to invertebrates when the reservoir refilled the following summer. Results of the study were published today in the journal PLOS ONE. The unusual decline in “trophic levels” of aquatic top predators has rarely been documented outside of a laboratory setting, the researchers noted. For the bass and trout that remained in the reservoir, switching their diet from fish to zooplankton is less advantageous, Murphy said. A comparison of fish populations between 2006 – before the draining of Fall Creek Reservoir began – and 2017 found that the number of salmon in the reservoir appeared roughly the same, trout were hard to evaluate because of stocking, and the number of bass had declined significantly. Returning adult spring chinook are captured below the dam at Fall Creek and trucked above it, where they are released to spawn. The juvenile salmon stay in the reservoir for several months, and begin migrating downstream in the fall. The Army Corps of Engineers releases the water from the reservoir to assist their migration. “It is a novel life history,” Ivan Arismendi, an assistant professor in the Department of Fisheries and Wildlife in OSU’s College of Agricultural Sciences and co-author on the study. Murphy said, “It’s all about priorities and tradeoffs. “You can decide to minimize the warm-water fish coming out of the dams, but then you’re not providing any help for the juvenile salmon migrating downstream. When you drain the reservoir, you’re not only sending juvenile salmon downstream, but bass, trout, bluegill, bullheads and other fish. Gregory Taylor of the U.S. Army Corps of Engineers was a co-author on the study. Funding for the research was provided by the U.S. Army Corps of Engineers.